SOROS CHIEF: I know nothing about Albanian Nazi statues in Macedonia – Alternate Comms. Soros Organisation Chief in Macedonia over Albanian Nazi statues – I KNOW NOTHING! The head of George Soros’s Open Society Foundations in Macedonia Ms Fani Karanfilovska-Panovska has told Team Uzunov blog / Alternate Comms website she isn’t sufficiently knowledgeable to comment over concerns that Macedonians in the Republic and abroad have about Albanian Neo-Nazism in Macedonia nor condemn Albanian Nazi collaborator statues. Controversial US billionaire philanthropist George Soros’s Open Society Foundations in Macedonia has issued thousands upon thousands of pages in “advising” Macedonians about “civil society” and democracy and so Ms Karanfilovska-Panovska’s admission of not having any idea over the controversial issue comes as a surprise as in the Soros Organisation. Soros’s critics have accused him of funding name change for Macedonia at the behest of the US and Greece. Albanian politicians in Macedonia have strongly supported name change as well as doing the bidding on behalf of US foreign policy. 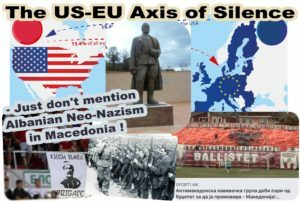 Both the EU and US have deliberately remained silent over Albanian Neo-Nazism in Macedonia. 1. Дали ги подкрепуваш спомениците на Албанските соработници/колаборатори со Хитлерова Германија во времето на Втората Светска Војна – како Џем Хаса Гостивари итн.? 2. Во сегашна Германија споменици за Нацисти се забранети. Зошто Албанската заедница во денешна Македонија “слави” личности како Џем Хаса Гостивари, колаборатори на Хитлер? 3. Дали си свесна дека голем број Македонци во Република Македонија и ширум светот се заплешени околу Албанскиот Нео Нацизам во Македонија? 1. Do you support the monuments in Macedonia to World War II Albanian Nazi collaborators (with Adolf Hitler’s Germany) such as Xhem Hasa Gostivar, etc.? 2. In modern day Germany, statues to Nazis are banned. Why does the Albanian community in today’s Macedonia have the need to “glorify” figures like Xhem Hasa Gostivari, a collaborator of Adolf Hitler? 3. Are you aware many Macedonians in Macedonia and around the world are concerned with Albanian Neo Nazism in Macedonia? 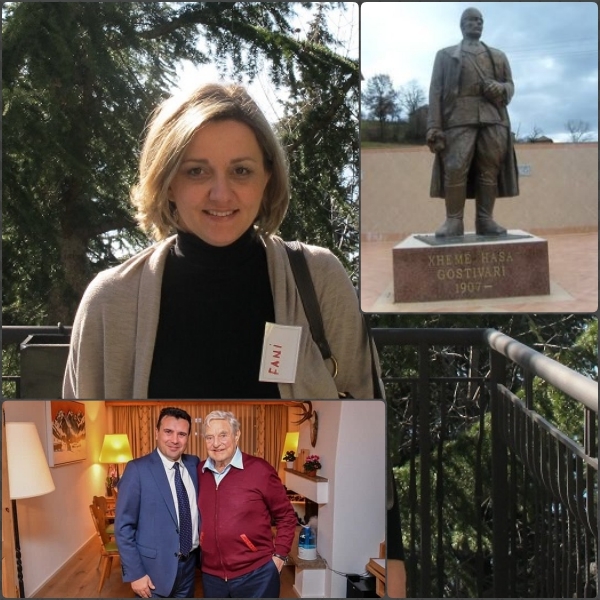 Other experts who have declined to comment about Albanian Nazi statues in Macedonia, include Besa Arifi, a prominent Albanian academic in Macedonia and Uranija Pirovska, head of Helsinki Human Rights Committee, and academic Mirjana Najchevska – see link here to Najchevska story.